I mean, after all, how can you pass up owning a movie where the characters fart glitter? Dreamworks Animation has given us many of our favorite animated movies. The Shrek franchise, Kung Fu Panda franchise, and How to Train Your Dragon franchise are just a few of the great works coming out of this studio. In fact, there aren't many productions that Dreamworks has had that aren't successes but I guess there is always that one movie that just doesn't make the impact hoped for, and Trolls would be the one film that didn't hold its own by Dreamworks. Trolls is a story about little happy trolls who get eaten by big grumpy Bergens once a year on Trollstice. Eating the trolls makes the Bergens happy and they believe without this divine food, they would never know happiness. 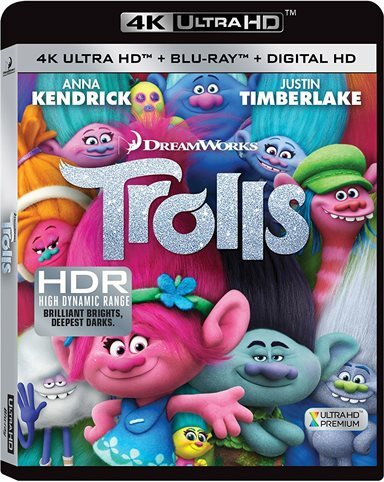 One Trollstice, the Bergens go to eat Princess Poppy (Anna Kendrick; Pitch Perfect) but the King of the Trolls has evacuated his troll kingdom and ensures that "no troll is left behind" while evacuating. Fast forward twenty years and Princess Poppy is throwing a party to mark the anniversary of being Bergen free but an usually grumpy and pessimistic troll, Branch (Justin Timberlake; Out of Time) warns her that the Bergens will find them because of the party. Dismissing his concerns, Poppy throws the loudest party and the obvious happens - a lone Bergen does find them and kidnaps some trolls and takes them back to the Bergen Kingdom. In an epic tale, Princess Poppy and Branch set off to rescue their friends and end up not only saving the Trolls but forging a new relationship with the Bergens. Anna Kendrick is funny and cute as Princess Poppy. Kendrick's singing is - as usual- beautiful and she is cute as the voice of Poppy. It's not Kendrick's fault that her character is an emotionally immature princess who miraculously can relate to others and save worlds. On the other hand, Timberlake's character, Branch, is as real as a character can get. He is paranoid and grumpy. He seems to suffer from anxiety also, which makes sense in the scheme of things. Branch is also honest and loyal, although it takes him a while to come out of his shell and show his "true colors". And, like Kendrick, Timberlake's singing helps keep the movie going. Mike Mitchell directed Trolls, along with co-director Walt Dohrn. Despite the overdone plot and break-out song, the movie flowed and the characters, at least, were new and refreshing. The 4K Blu-ray is presented in 4k Ultra High Definition with an aspect ratio of widescreen 2.35:1. The back cover of the disc states that the resolution is "4 times sharper than HD", which is pretty accurate. In a movie where the colors make such a difference, Dreamworks nailed the cinematographic presentation of this film. The Trolls popped off the screen in artistic color and provided a point of focus for the viewer. Something rarely mentioned is that the 4K UD Blu-ray does not have automatic previews which makes the viewing experience much better than sitting through previews you don't want to see. Nonetheless, you can skip the previews on the 1080p HD disc if you get to the remote quick enough to hit the "skip next preview" or "play movie" button, but, you'd have to be Flash to get to it quick enough. An additional feature on the 1080p disc is the option to choose between Party mode Sing A Long or just Sing A Long. Party Mode in High Definition and Sing Along (only on the 1080p HD Disc) are amazing features. You can choose your mode of watching the Blu-ray. Do you want to just sing along with the song lyrics on the bottom of the screen? Or do you want to hug, set off a glitter party, give high fives, see cupcakes popped, or press a green button to see other features during the Bergen scenes? Clearly, the Party Mode is extremely interactive and will keep the younger ones entertained over and over and over again. One of the best features I've seen on a Blu-ray movie release to date. Audio is Dolby Atmos and English Descriptive Audio 5.1. The dialogue was heard clearly and the emotions of the characters were executed well by the actors. Songs were clear and it was nice to be able to hear both the music and lyrics without having to make a choice between capturing the sound of one over the other. Travel Through Troll Village: Meet some of the Trolls, including Poppy, Biggie and Mr. Dinkles, the Twins and more, while taking a ride through the Troll Village. The Potion for Stop-Motion: Hair, paper, thread, gems, clay, are some of the things that make up Stop-Motion. Listen to the production crew, designers, and other crew members explain how they created Poppy's scrapbooks and some of the animation kid-like. Did you know they cut over 1000 pieces of paper? Wow! Inside the Bunker: Cloud Guy takes us on a tour of Branch's Bergen Proof Survival Bunker. I have to say that it's amazing as to the detail that went into the creation of the Bunker. Deleted Scenes: Always interesting to see what Scenes the directors decided to cut to ensure the flow of the movie. Dreamworks provides commentary from the Directors as to why scenes were cut, which is a plus, as most deleted scene extras just play the cut scenes without any explanation. Troll 2 Troll: Debate the big questions between Branch and Poppy. Cat or Dog? Early bird or Night Owl? This extra actually provides a lot of humor that people of all ages can appreciate. Theatrical Trailer: Watch the Theatrical trailer starring Branch and listen to him complain about Poppy and watch him go on the adventure of saving his friends with Poppy. The World of Dreamworks Animation: Watch music videos from several other of the most popular Dreamworks films with extra features provided. Sneak Peak: Take a look at some of the other Dreamworks Animations coming out, including Boss Baby, Sing, and others. Overall, while the plot just can't be saved from what seems like an overdone, cliched tale that we've seen "time after time", the colors alone of the 4K disc and the Blu-ray's bonus features, along with the choice of how to watch the movie - either Party Mode or Party Mode with Sing A Long makes this purchase worth every penny. I mean, after all, how can you pass up owning a movie where the characters fart glitter? Download Trolls from the iTunes Store in Digial HD. For more information about Trolls visit the FlickDirect Movie Database.